A son, Henry Charles Albert David, known as Harry, was born to Prince Charles and Lady Diana at the Lindo Wing of St Mary’s Hospital, London. Harry was christened at St George’s Chapel, Windsor. Harry accompanied his parents on a tour of Italy. Harry attended Mrs Mynor’s Nursery school. Harry attended Wetherby Prep School, Kensington, London. Harry and his brother William went with their parents Charles and Diana on a 4 day visit to Ontario, Canada. Harry’s maternal grandfather, Earl Spencer, died of a heart attack. Harry attended Ludgrove School, Berkshire. It was announced in the House of Commons that Harry’s parents, Prince Charles and Lady Diana, were to separate. The marriage of Harry’s parents. Prince Charles and Lady Diana, was formally dissolved. Custody of their children was shared equally. Harry’s mother, Lady Diana Spencer, was killed in a car crash in Paris. Harry and his brother William were told the news at Balmoral Castle in Scotland. Harry and his brother William walked in procession behind their mother’s coffin with Prince Philip, Prince Charles and Earl Spencer. After a service at Westminster Abbey she was buried on an island at the Althorpe family estate. Harry enrolled at Eton College. Harry and his brother William made a formal request to the media to allow them some privacy in their lives. Harry left Eton. He gained 2 A-levels in Art and Geography. Harry took a gap year from his studies which was spent in Australia working on a cattle station. Afterwards he worked with orphaned children in Lesotho. William and his brother Harry volunteered to help the British Red Cross organising supplies for countries affected by the Boxing Day 2004 tsunami. Harry attended the Royal Military Academy Sandhurst. Harry was romantically linked with Chelsy Davy, daughter of burinessman Charles Davy. Harry completed officer training and became a second lieutenant in the Blues and Royals. 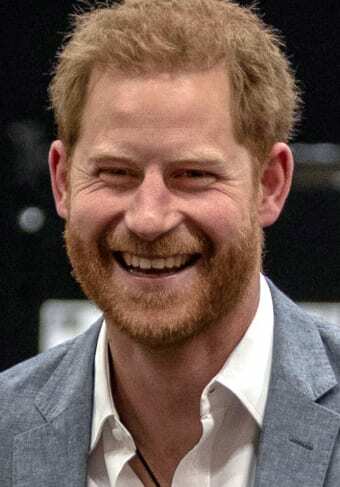 Harry was told that he would not be able to servde with his unit in Iraq as he was a high risk target and threats had been made against him by various groups which could endanger the lives of his regiment and himself. Harry was unhappy with the decision but had to agree. Harry went to Canada to train with soldiers of the Canadian Forces . Harry was sent to Afghanistan but a blackout was imposed on media reporting of the fact. Harry received the Operational Service Medal for Afghanistan. Harry split from girlfriend Chelsy Davy. Harry began training to fly military helicopters. Harry completed his flying training. Harry passed his Apache attack helicopter flying test. Harry was promoted to Captain. Harry was best man when his brother William married Catherine Middleton at Westminster Abbey. Harry made a tour of Belize, the Bahamas and Jamaica as part of the Queen’s Diamond Jubilee celebrations. Harry began a relationship with Cressida Bonas, granddaughter of Earl Howe. Harry represented Queen Elizabeth II at the closing ceremony of the London Olympic Games. The American celebrity Website TMZ published pictures of Harry naked in a hotel room with an unknown woman. Harry claimed that his privacy had been invaded by the media. Harry began a four month tour of Afghanistan. Harry made a six day official visit to the United States. Harry qualified as an Apache aircraft commander. Harry made a tour of Australia. Harry launched Invictus Games, a sporting event for injured servicemen and women . Harry and Cressida Bonas ended their relationship. Harry visited Brazil and Chile. Harry attended WWI centenary commemorations in Folkestone and Belgium. Harry opened the first Invictus games was held at the Queen Elizabeth Olympic Park. 14 nations competed over four days. Harry opened the Field of Remembrance at Westminster Abbey. Harry made a visit to Lesotho. Harry and other members of the royal family attended a service at St Paul’s Cathedral to mark the ending of British involvement in Afghanistan. Harry was in Turkey with his father, Prince Charles to attend centenary commemorations of the Gallipoli Campaign. Harry left the armed forces to take up more royal duties on behalf of the Queen. Harry was made a Knight Commander of the Royal Victorian Order. Harry went to Lesotho for the opening of the Mamohato Children’s Centre. He then made an official visit to South Africa. Harry visited Nepal. At the end of his visit he helped Team Rubicon UK rebuild a school damaged in the earthquake of 2015. Harry opened the second Invictus games in Orlando, USA with 15 nations competing. Harry met American actress, Meghan Markle at a club in Toronto and they began dating. Harry, William and Kate attended the centenary commemorations for the Battle of the Somme in France. Harry took a HIV test to raise awareness of testing. Harry made a two week tour of the Caribbean on behalf of the Queen. It was announced that Harry was in a relationship with American actress Meghan Markle. Harry opened the third Invictus games in Toronto, Canada. During the games he and Meghan Markle made their first public appearance together. Harry was appointed President of Africa Parks, a conservation organisation in Africa. Harry was appointed President of the Queen’s Commonwealth Trust. Harry married Meghan at St George’s Chapel Windsor. The Queen created Harry Duke of Sussex, Earl of Dumbarton and Baron Kilkeel. Kensington Palace announced that Meghan is pregnant and their first baby will be born in the Spring. The announcement was made as she and Harry began a tour of Australia.